Is owning a pet in Australia too expensive? Australia has one of the highest rates of pet ownership in the world with more than 24 million pets nationwide. But the number of people who want to own a pet is greater than the number who actually do. While 53% of us would like to purchase a new pet, only 13% of those plan to purchase one. This suggests that for many of us, there are still plenty of obstacles putting a damper on owning a pet. So what exactly is getting in the way? As our country becomes increasingly urbanised, many living environments are becoming less suitable for pets. The move toward high-density housing in city areas is a significant deterrent. Strict no-pet policies are common in many apartment complexes. For ‘Generation Rent’, this can be a problem – barriers to home ownership quickly translate into obstacles to owning a pet. Landlords know that pets can result in extra mess and noise complaints, so pet-restrictive rules help protect their investment. Even in homes where pets are allowed, there are other considerations to make: safety, noise, sufficient room for the animal. Yards are getting smaller, neighbours are getting closer and our lives are becoming increasingly regulated. Which means having a pet becomes a little more complicated. Owning a pet benefits us in many ways. They provide companionship, pets teach us compassion, empathy, commitment and how to look after a creature more vulnerable than ourselves. Pets can make life more fulfilling and also create extra incentive to get outdoors and exercise. With these lifestyle advantages come some extra demands, however, and these must be carefully weighed against ‘the fun stuff’. Having a pet as part of your household doesn’t change your life as much as having a child, but it definitely adds an extra element of daily responsibility. Social media and a ‘more experiences, fewer possessions’ mindset may also be detracting from the appeal of owning a pet. We’re now a more mobile society, wary of being tied down because the pace of life is so fast. Social media may be at least partially replacing the human need for companionship that was once provided by a pet. In an age when we switch jobs and locations more frequently than ever, the commitment of looking after an animal can put people off. After all, a dog needs regular walking once or twice a day and may live for 15 years. These extra obligations might discourage those who want to take numerous overseas holidays or maintain a more flexible lifestyle. In decades past, one half of a couple often stayed at home while the other went off to work. These days, more couples need to both work, which means the pet is left behind at home. This basic change in household dynamics might also cause people to think twice before committing to a pet. And just because one person in a household desperately wants a pet, doesn’t mean everyone does. It’s not uncommon for one half of a couple to be a ‘cat person’ and the other a dog fan – or not want any kind of pet at all. For many people, cost is a significant barrier to owning a pet. Owning and looking after an animal isn’t cheap these days. 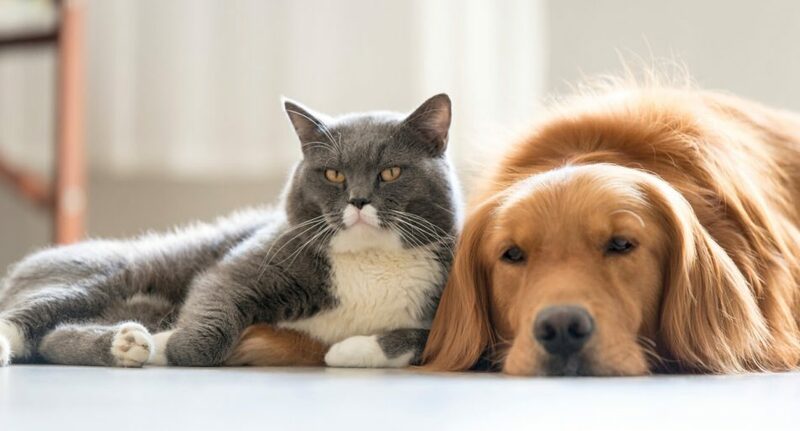 As a nation, we currently spend $12.2 billion a year on pet-related products and services – everything from birdseed and cat scratching posts to dog toys and aquarium filters. The pet industry is growing in leaps and bounds – our expenditure is up 42% in just the last three years. Pet healthcare is big business in this country. Treatment for parasites (internal and external) makes up nearly two-thirds of all pet healthcare products sold in Australia. Serums and vaccinations came in second (around 15% of pet product sales). There are also microchipping costs, flea, worm and tick treatments and regular vet check-ups. There are also the surprise expenses of illnesses and injuries that crop up for your pet along the way. Because pet insurance is still a relatively new product in Australia, it’s something that a lot of people don’t fully understand or appreciate – but with pet ownership costs rising, it’s a form of protection that more of us are starting to value. Some pet accessories are less essential than others but all add to the annual costs of owning a pet. If your pet is going to travel in the car with you, they’ll need an appropriate restraints. Cat litter, scratching posts, toilet mats, pet kennels or beds, leashes, harnesses, collars, toys, winter coats and all the rest can add up in a hurry. With busy lives, many pet owners now outsource many of the services that previous generations might have performed themselves. There are now multitudes of dog walkers, obedience trainers and groomers. The larger the animal and the more pets you own, the heftier your yearly costs will be for pet food. Premium quality wet and dry dog food might set you back around $800 a year. The initial cost of purchasing a pet can be a deterrent too. Animals purchased from shelters are more affordable but if you’re after a particular breed it can be a different story. You could be looking at anywhere from several hundred to several thousand dollars to get the pet you want. Adding ongoing expenses to initial purchase price, ASIC estimates the cost at $3000-$6000 for the first year. And that’s excluding any unexpected medical expenditures. [iii] For cash-strapped folks, these can be some pretty daunting numbers. Reasons for wanting to own a pet haven’t changed much over recent decades but the way we live certainly has. With these lifestyle changes have come a realignment of priorities and new perspectives on exactly how dogs, cats, parakeets and goldfish fit into the picture.